ACTION! Starting from the 1 till 16 of August there is a 25% discount on cottage number 1. 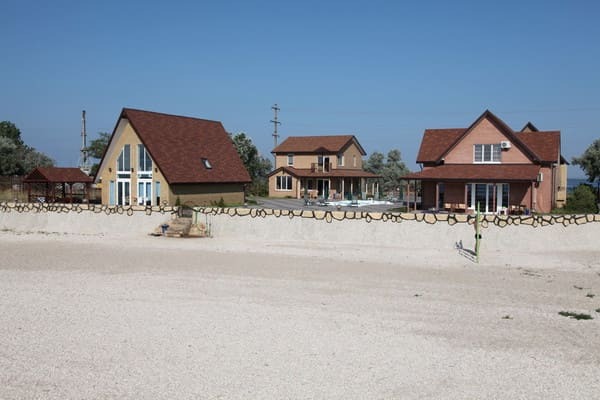 In ten kilometers from the city center, on average Spit on the shores of the Sea of Azov is located a cottage complex Santa Villa. 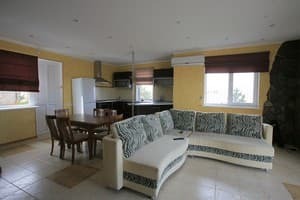 Holidays in Santa Villa - this is a truly unique offer: four modern, comfortable cottages, built in 2008 by the English Project will allow for a while to realize your dream - a house on the beach. Luxury cottage in the English style, with all the trappings: Landscaping the area around the house, landscaped terrace with sea views, private pool, BBQ and much more. All that distinguishes a comfortable villa on the beach from the hotel room, even, of a luxurious hotel. However, we do not deprive our guest with service offered in premium hotel, and we offer additional features and services that make your stay at Santa Villa at the VIP vacation at sea. You will be pleasantly surprised by the hospitality hosts and attentive staff. We treat theravelers like good friends, and try to remember the name of each of our guest. After spending the summer at the Santa Villa, you can tell your friends that rest on the Azov Sea in Berdyansk, in terms does not inferior to the resorts of the Crimea, Turkey or Egypt. Описание номера: Accommodation up to 8 persons. Surcharge is 100 UAH for each person. House number 1 is located in the first line of our cottage complex. This is the most original and at the same time quite roomy cottage, designed in modern style. THe distinctive feature of this house is the magnificent view of the sea from every floor, due to its panoramic façade consisting of 80% glass. Quite large capacity, combined with a stylish alcove will allow large companies enjoy the rest at Santa Villa with maximum comfort, both in summer and in spring and autumn. 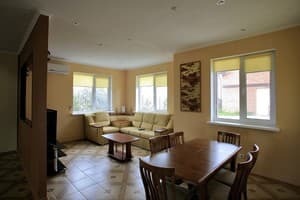 Описание номера: Accomodation up to 8 people. Surcharge is 100 UAH for each person. House number 2 is located in the first line of our cottage complex and is the most comfortable, though not the biggest. The main feature of this house is that it is closest to the sea. In addition, it is the only house in front of which a pool is established for the summer. In front of the house you have a hammock, comfortable sun lounges and a stationary grill (skewers, grill) at your disposal. Description of the room: Accommodation up to 8 persons. Surcharge is 100 UAH for each person. House number 4 is in the second line of our cottage complex. The distinctive feature of this cottage is very comfortable layout in a classical style and the presence of a sauna on the first floor. Near the house you have a hammock, comfortable sun lounges and a stationary grill (skewers, grill) at your disposal. Расположение шикарное. Пляж пустой, море чистое. Домик большой с отличной задумкой панорамных окон. В домике довольно комфортно. Понравился повар, приятная женщина + вкусно готовит. С чистотой в домике было все плохо. Уборка была проведена 1 раз перед поселением, и то для галочки. Хотя нам сказали, что будут убирать каждый день, никто так и не пришел за 3 дня. Огромные панорамные окна были грязные, в разводах...вся изюминка этого домика была испорчена. Половина комфорок на печке не работало(я молчу про её внешний вид), с холодильника воняло едой да и сам холодильник был грязный. Очень не понравилось, что к нашему приезду (мы приехали часа на 2 позже заселения) домик не был готов. И еще пол часа у нас по домику бегал обслуживающий персонал, что-то делал. Больше всего меня поразило, что при выезде с домика, женщина которая убирает спросила на каком этаже мы жили, чтобы типа не весь домик убирать. Это как нормально вообще?! Мы же платили за весь домик, а не за этаж отдельно. При въезде охранник спросил выносить ли нам лежаки, мы подумали вот сервис, здорово. Рано радовались. Через день нам нахамили и сказали, что у нас нет рук самим занести/вынести лежак и зонтик. Задумка хорошая, но сервис ужасный. Больше не приедем, и никому не посоветуем. Children under 5 years without a seat, settle for free. Each house has a kitchen for self-catering. Guests can order meals at an additional cost. Our complex is situated on the seaside of the Sea of Azov. The possibility of year-round acquisition of courses in the sanatorium "Berdyansk". On a fixed-route taxi with the direction of "Spit". Landmark - dolphinarium and water park. From the water park to the hotel - 3.5 km.